THE TIME HADcome again for the Passover Feast at Jerusalem, and Jesus knew that his life on earth would soon be ended. He took his twelve disciples aside from the crowd which followed and told them again that soon he should be given into the hands of the chief priests and the scribes, his enemies, and he condemned to die. But the disciples could not understand; for they believed surely he was the son of God and that he would become the king of the Jews. Two of his disciples, James and John, came to him soon afterwards, bringing their mother. She knelt before Jesus and asked him to grant places of honor to her sons when he should receive his kingdom. But Jesus knew these disciples and their mother did not understand that the kingdom of heaven would not be like an earthly kingdom, and he said that places of honor would be given only by God the Father. The other disciples felt jealous of these two, and Jesus knew about their feelings. So he called them aside again and told them that in his kingdom those who would be great must be the servants of all the others. He reminded them of how he had labored hard and long for others, and he told them that they should be willing to serve others, too. Many other people were going to attend the feast at Jerusalem, and they walked along the roadway with Jesus and his disciples. These people had heard Jesus teach and they had seen him heal the sick. They, too, hoped that he would set up his kingdom in Jerusalem at the time of this feast. 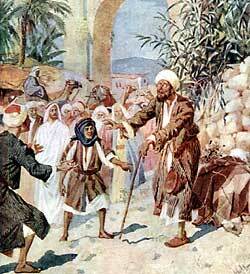 By and by the multitude came to a city called Jericho. The road to Jerusalem led through the streets of this city, and soon the people of Jericho were much excited because Jesus was with them. News of his coming spread rapidly from one part of town to another, and many who had heard of this wonderful man came rushing to see him. Those who stood by were displeased to hear the blind beggar crying after Jesus in this manner. They told him to keep quiet. Perhaps they said that Jesus could not hear him; for the noise of the crowd was great. But Bartimaeus would not be quieted. He only cried louder than ever; for he wished to have Jesus heal his blinded eyes. Bartimaeus threw aside his garment and ran eagerly to the place where Jesus stood. “Lord, give me my sight,” he asked. At once the blind eyes opened, and Bartimaeus could see as well as those who had never been blind. And he joined the crowd to follow Jesus.